To convert the Traditional Hydrotherapy Hyperhelper stack to HTML, I used Vim, a really great little text editor under Vector Linux. In the last post I showed the original "Visceral Congestion" card in the "Harvey" stack. In all the catarrhal diseases - increased mucous ie. In future posts I will show you how I have achieved this with Vim. Your browser is designed to read the HTML code on a web page and turn it into something pretty. In my next post I want to show you the code behind the HTML. In order to do that I had to "escape" the code. Of course I used Vim to do this with its Substitute capabilities. So to change the "<" on the tags in the code to one that would be displayed as code by your browser, I had to use the code "&lt;"
g - global flag ie change all occurrences, by default only one occurrence is changed on each line and we usually have two. Not really... It changed "<" to "<lt;"
Vim reads the "&" in the "to" to mean the "from" AND the "to". To solve I had to escape the "&". First I had to correct my mistake and that was easy, I just pressed "u" and it "undid" the last edit command and everything was back to original. which worked perfectly. The "\" means that the letter after is not to be parsed by Vim. If you have followed me so far you can imagine what the file looked like with every symbolic "&" showing up as "&amp;". But the fix was easy... "u" to undo. So it is ready to go onto the next post. One more point, you will notice all the pretty boxes that the code is in, I got the tip from a post by Simrandeep, "Display HTML/CSS Codes On Coloured Background In Blogger Posts"
"Traditional Hydrotherapy" will soon be in HTML as a group of linked web pages. The original program was started before HTML was widely used and was written, under DOS, using a shareware program, PCWrite. It's main advantage was that it produced documents in plain text which is what I needed for Hyperhelper, the hypertext program that runs the original DOS programe. Hyperhelper compiled a text file with fairly simple markup, into a hypertext stack. One of its strengths is that it doesn't need links to be marked up, as they are in HTML. The links work much like wiki words, if you have the same spelling you can just put your cursor on the word and click or and it will take you to the card of that name. Great for quick writing especially with word completion and shortcuts etc in PC Write. Once the Hyperhelper program was compiled you could distribute the stack. 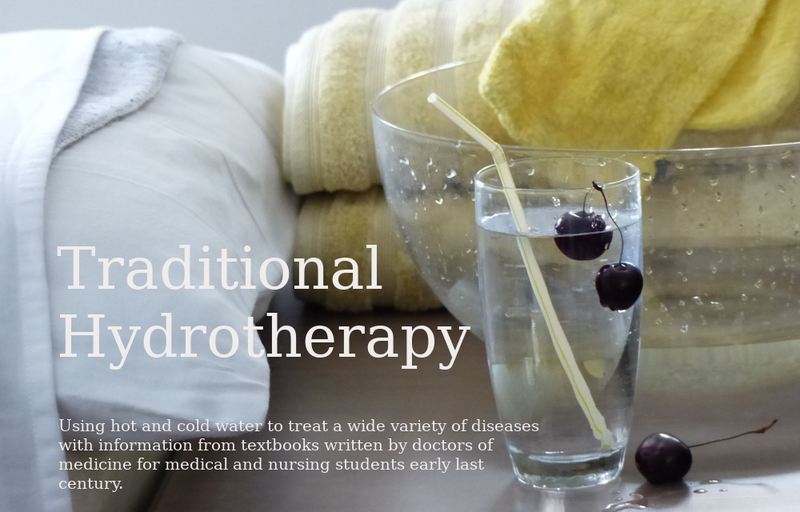 You can download the original "Traditional Hydrotherapy" stack. But you will have to run it on DOS or something like DOSBox. 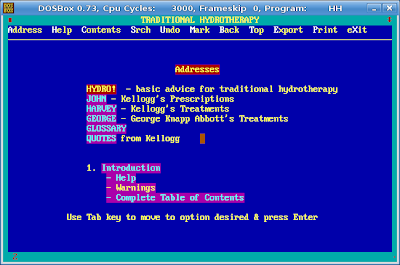 After almost 20 years of work (on and off) I am getting near the release of my summary of Kellogg's and Abbott's books on hydrotherapy as web pages. This process equates to the 5th step of my To Do list. Although I'v already worked out most of the css from the 7th step and will probably do that at the same time.